A principal evaluation technique for rural sites under cultivation, fieldwalking is often required for large-scale sites such as proposed quarry sites, pipeline routes and roads. Also known as surface collection, the technique is simple, low impact and causes little or no disruption to a site. We are also able to undertake test-pit excavation to investigate artefact distribution at sites not under the plough. Our fieldwalking service represents just one technique in a battery of evaluation methods that we can offer in-house. We are able to execute projects efficiently using digital survey methods and team up with a raft of artefact specialists to quickly get reliable distribution plots by artefact type and date. 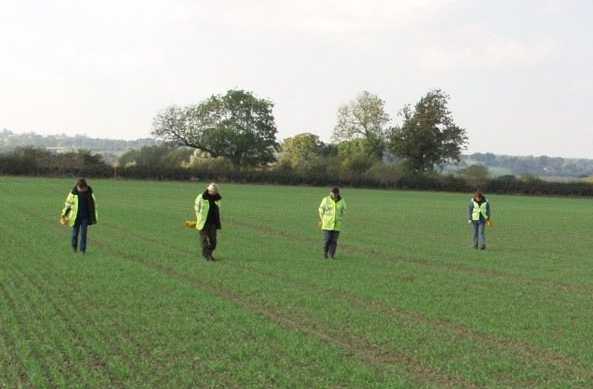 These distributions provide invaluable evidence for the location and nature of underlying archaeology which can be used to inform other evaluation techniques such as trial trenching and geophysical survey.